Our new workshop dates for the first half of 2014 are up on the website. If you were on the waiting list for any of these workshops you should have received a phone call or email from Karen in the past days. Please get back to us ASAP and let us know if you can take the class or if you aren't available on that date. At the time of writing this we have spaces available on all our workshops... they would make a great Christmas Gift... you could drop some hints... or buy for a friend! Next year we have scheduled 2 dates for the very popular (and life changing) Finishing Techniques course. learn the secrets of mattress stitch! They are on Sunday 16th February and Sunday 11th May. You need to do a small amount of homework for this course which you collect when you book the course. It involves knitting a few squares... so you have something to sew up on the day! We also have 4 beginners workshops... First Steps in Fair Isle (Sunday 2nd March), Beginners Socks (Sunday 23rd March), Learn to Crochet (Sunday 27th April) and First Steps in Lace (Sunday 29th June). And a brand new course - Colour and Steek on Sunday 8th June. A steek is a bridge of stitches placed within your knitting at an opening point. Such as the front opening of a cardigan. It allows the knitter to keep working in the round without interruption. When the knitting is complete, the steek is then cut and reinforced, thus creating the required opening. This new workshop is designed for those who are interested in learning how to work a simple steek and improve their stranded knitting technique while working in the round. 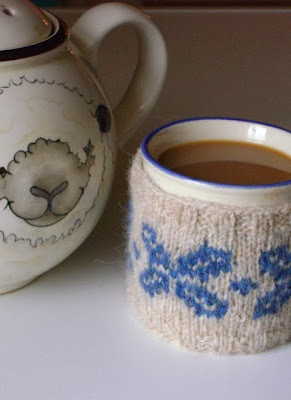 During the class you will work on a mug cosy using your chosen method of circular knitting. You will learn how to carry one colour of yarn in each hand, how to follow a Fair Isle chart and how to complete a simple steek using only your knitting needles, wool needle and scissors. Other methods of steeking will be demonstrated. We'll provide all the materials, you just need to bring some scissors (and a pack lunch!). You must be able to work in the round and follow a simple pattern before undertaking this class. Check out our workshop page for details on all our workshops and read about your tutor Janice Anderson. Janice has written all the course material and is a very patient teacher on the day!